Do you have low testosterone? Take this short quiz to find out. Do you feel you may have low testosterone? Take the ADAM (Androgen Deficiency in the Aging Male) test to see. Please answer YES or NO below. 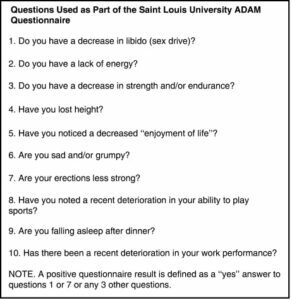 If you answered YES to questions 1 and 7 or answered YES to 3 or more questions, you may be suffering from low testosterone.